Good news: Your mom's hatching a baby! Bad news: Babies take their sweet time. And when they finally do hatch? They’re too little to play! They don’t even know how to be a dinosaur. That's where you come in. You can teach your baby everything—from peek-a-boo to roaring to table manners to bedtime. 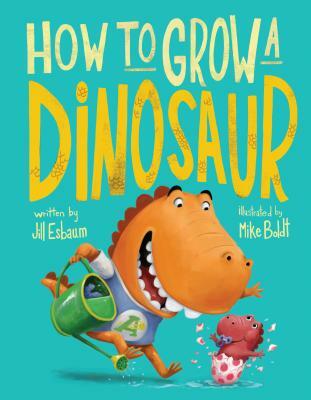 Growing a dinosaur is a big job, but you're perfect for it. Because one thing the baby wants more than anything? It’s to be just like you. Silly humor and sincere, moving moments, make this hilarious, reassuring, and useful “guide” a must for existing big brothers and sisters and for every big brother and big sister to-be. Great fun for family reading too. Jill Esbuam reads everything--books, magazines, the backs of cereal boxes, you name it. She's a full-time, award-winning writer and the author of I Am Cow, Hear Me Moo! ; Stanza, Tom's Tweet; and many others. Jill and her husband live on a farm in Dixon, Iowa, where green walls of corn surround their yard each summer, and she gets to drive a huge tractor each fall harvest under a blue, blue sky. Mike Boldt is an author and illustrator living in the countryside of Alberta, Canada. He has been illustrating for children for the past fifteen years, including the picture books I Don't Want to Be a Frog and I Don't Want to Be Big. When he's not drawing, he's building snow forts and LEGO spaceships with his three kids, or sharing laughs and his ice cream with his wife.